The Beatles Through The Years: There's Nowhere You Can Be That Isn't Where You're Meant To Be... It's Easy! There's Nowhere You Can Be That Isn't Where You're Meant To Be... It's Easy! 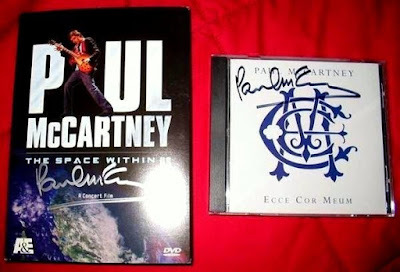 This one time, many moons ago (aka 2006), I heard on the radio (MaccaRadio, that is) that Paul McCartney was going to be doing a signing of his CD, Ecce Cor Meum, and his DVD, The Space Within US, at the Virgin MegaStore in Times Square (which is now the Disney Store, I believe) in New York City. I had heard the news on a Monday, I think, and it was something like the following Monday that it was going to occur. I had a week to decide and had been wishy-washy for most of that time, because getting to meet him wasn't going to be a sure thing. (Did I mention I live in Texas?) I had posted a few blogs on MySpace (I know) about the matter, after I'd heard the news, and had received mixed advice on what I should do, but the Saturday before it was set to happen I decided I couldn't let the opportunity pass me by. The following is a blog post from November 20, 2006, that I saved before I closed down my MySpace. As you may or may not know, I was debating whether or not I should go to New York City to meet Paul McCartney. It was too expensive, not worth the time in the long run, crazy, etc., etc., etc... BUT, last Saturday I still wanted to go. I wanted really, really badly to go. Music is very important to me and the man is like a God in my eyes. One of the geniuses of our time. (If you don't agree, please remove yourself from my "Friends" list.) And, after much whining on my part, my mother thought she'd taunt me a little. Surprisingly, there was a fairly affordable flight. (Well, except now no one is getting Christmas presents from me this year.) By this time it was about 3:00 in the afternoon. I tried to book the flight online, but the flight left Austin at 5:20pm, so it wouldn't let me. I jumped in the shower and when I got out, I tried to book the flight over the phone, but the woman said I would have to try at the airport. She couldn't book it because it was so close to the departure time. So, I threw some stuff in a bag, grabbed my coat and rushed out the door making it to the airport at around 4:30pm. (But forgetting my reading glasses. It was going to be an interesting trip not being able to read anything the whole time! lol!) The man at the desk said I could still book it, so I did! I got to LaGuardia around 11:30pm and decided to stay there for a few hours before going to get in line, so I found a gate where there were a bunch of people from a canceled flight (at least I assumed that was why they were there), asleep on chairs and on the floor and I decided to join them. I don't know if I was too excited or just too uncomfortable, but I couldn't get to sleep. I tossed and turned for hours. I slept for about an hour total! And by 4:45am I was done. I went to the bathroom and washed my face, brushed my teeth, and then caught a cab to Times Square. 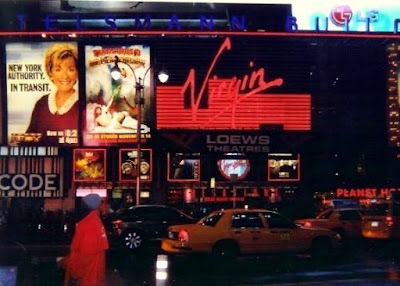 I arrived at the Virgin Mega Store at 5:30 in the morning and was #46 in line! I was guaranteed a chance to meet Paul McCartney! A view of the Virgin Mega Store where I was camped out, from across the street at this hotel where all of us in line kept going to warm up and to use the restroom! I watched the sun come up in Times Square and the crowds begin to pick up and I made friends with the other people that were in line around me. It was nice because we knew we all had something in common, otherwise we wouldn't be there. We all took care of each other's things when we needed to go use the restroom, or to get something to eat, or just to stretch our legs. They were mostly all New Yorkers (complete with the accent) and they were well prepared with chairs etc. and all I had brought with me was a little blanket, so one of the men that was there gave me a chair to use while we were in line, which was unbelievably nice. Especially when it started raining! I would have been completely soaked had I been on my blanket on the ground. Everyone passing by asked why we were in line, which became pretty annoying after a while. Some people in line started messing with them, giving them ridiculous answers like, "We're waiting for the parade." 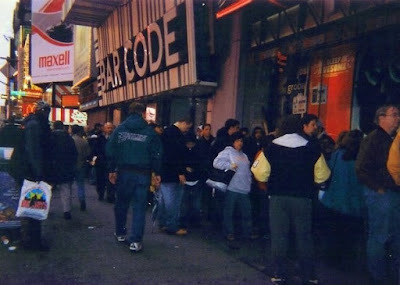 and "We're queuing to meet Ali G." and "We're already lined up for the new Playstation!" (Although now I see the Playstation excuse may not have been so silly after all since people really did line up for that!) And when we'd tell them we were waiting for Paul McCartney, the reactions were priceless. 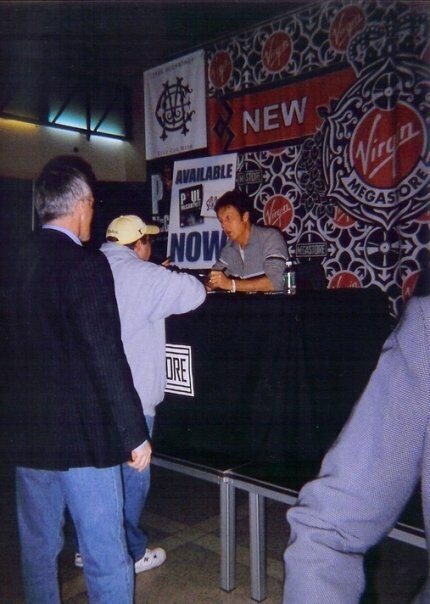 I particularly loved this one woman who almost started crying when I told her Paul was going to be at the Virgin Mega Store tomorrow (Monday). She said, "Oh, I love him, but I have to teach a seminar tomorrow!" And the look on her face was amazing because you could tell she was really trying to figure out how she could get out of doing it! lol! She was an older lady, so I'm sure she had probably been a fan as long as I've been alive, and probably longer! Lined up to go inside to get our wristbands. The line goes around the corner! Over 400 of us! At 8:00am they let us into Virgin to buy our CD and DVD for him to sign and in doing so we got our wristbands to meet him. Then we, all 400 of us by this time, were herded like cattle downstairs and into the tiniest, hottest, most cramped queue ever in the history of queues… and left to die… Or so, it seemed. I thought I was going to be sick. It was bad enough my stomach was already in knots over the fact that I was about to meet Paul McCartney, but I was dressed in layers to boot! Thankfully they moved us into another line that was more spread out and airy, but I still had to go peel off some layers. I felt nauseous and like I might pass out, but I know that I was not alone. Other women in line for the ladies room were all expressing to each other that they hoped they didn't "throw up on Sir Paul!" And I know they were not just joking because that was exactly how I felt. I made it out of there and back to my spot in line where I would have had a prime view of Paul coming down the escalator, only I didn't anticipate the media circus that was about to begin. 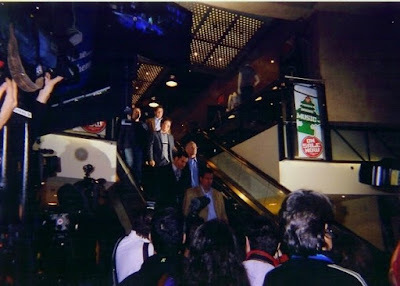 So when he came down the escalator I could barely hold the camera still. I was all nervous as if he was coming down to propose to me! The Associated Press, The Times, MSNBC, CBS, BBC… everyone… all came down and sat up their equipment RIGHT IN FRONT OF ME!!! But before long, there he was. And it was all I could do to stop shaking long enough that I could hold my little disposable camera and snap some pictures. He was really right there. I couldn't believe it! He began walking down the escalator and then he would stop and pose for pictures every few steps. Like my new Beatles friend, Michael, had said just a little while earlier, it is unbelievable to think all the things he's accomplished in his life. That his huge twirling, amazing lifeline, that included events like playing the Cavern, filling Shea Stadium, writing with John Lennon, his success with Wings, his solo achievements, his activism, his knighthood… everything, could one day… for one moment… cross with my little lifeline. Meeting me became, however minuscule, an event on that very same lifeline. UNBELIEVABLE. Flashes were going off everywhere. People were screaming his name from every direction, including from the upper floors of the store. He would stop signing and look up and wave to them which resulted in a chorus of screeches. You would have thought it was Beatlemania all over again. I can't imagine having spent most of my life like that, the way he has. By this point, I was so close my knees were shaking, full-on cartoon style! "I love you so much, Paul, I came all the way from Austin, Texas to see you." "Did you?" he asked in a voice that was so familiar. "Yes, I did. And I'm supposed to also tell you that my mother loves you, or I'm going to be in trouble when I get back home," I laughed. He looked at me; right into my eyes. "Please send her my love as well," he said sweetly. "May I shake your hand?" And as we shook hands he looked into my eyes again and said "Thank you, thank you," sort of quietly. When it came my turn to meet him, a strange sense of calm rushed over me. I told him I loved him! lol! And that my mother did as well, to which Paul wished my mother ALL HIS LOVIN'!!! Holy God! Then I asked if I could shake his hand. I touched the hand that's fingered that Hofner so many times over the years... I can die happy. It was strange how, even with 400 people on that lower level of Virgin Records, he could make you feel like you were the only person in the room. His handshake was firm and he waited for me to be the first to let go (which I must admit was a risk, because I could have held on forever! ), rather than sort of shooing me off. ("NEXT!") He just stayed there looking into my eyes. We finally broke and my moment was over. I was immediately directed upstairs, where I wanted to wait around to get a couple more photos, but it just wasn't happening. They had to "clear the floor." So, I rode the escalator up and then back down several times just so I could look at him for as long as possible! lol! There he was, a living legend, and I had just met him. I didn't get sick, I didn't pass out, I didn't even cry. I was amazed I had held it together so well. Finally I decided there probably wasn't much hope of seeing him leave the building, so I caught a taxi up to Central Park, to Strawberry Fields, so I could pay my respects to John while I was still in town, as my flight back to Austin left first thing the next morning. 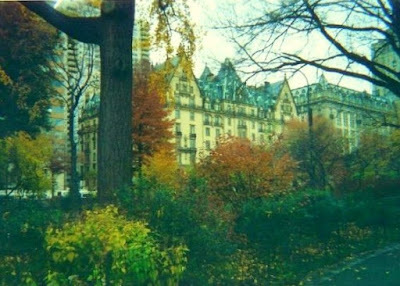 And as soon as I saw the Dakota (which I had already been to twice before on different trips to NYC) and made my way into Strawberry Fields, I began to think about John, and about all of the Beatles, and everything they meant and still mean to music and culture and the world, and especially to me. And like a lightening bolt, the enormity of what had just taken place hit me. 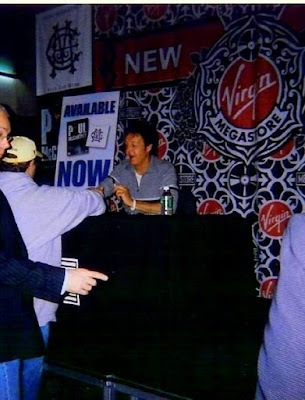 I had just met Paul McCartney! Easily one of the most important figures in history. I began to cry, sitting there all alone in Central Park, and I didn't even care. And after meeting Paul, of course I had to go pay my respects to John. Well... Lennon and McCartney go hand in hand, don't they? 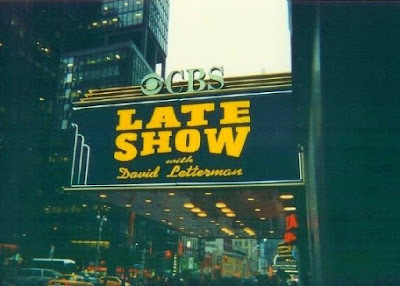 "Win free tickets to David Letterman today and tomorrow." I stopped and walked over to him. "Do you watch the show very often?" "Well, no, not very often." "Well, you have to answer a trivia question about the show." "Okay?" I figured I might as well try. I didn't have anything to lose. "What does the 'Grinder Girl' do?" Is this a trick question? I wondered. "What do you mean what does she do? She just grinds her stomach." "You DO watch the show! That's the right answer!" 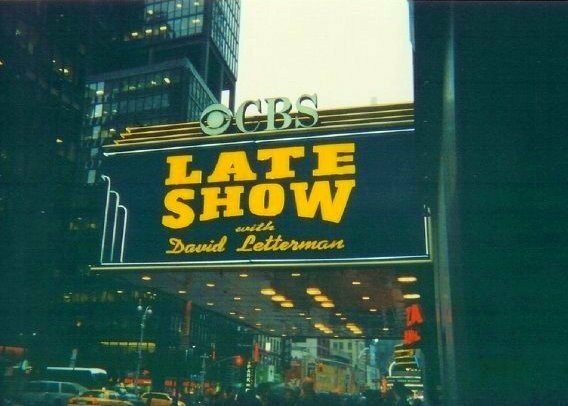 Aaahhh... to be in the old Ed Sullivan Theatre where Beatlemania began in America. What a PERFECT way to wrap up my little adventure! After that, I wandered around aimlessly, and went over to Rockefeller Center to see if the tree was up yet and sure enough, it was! There was scaffolding around it because they still have to add the lights, but I always wanted to see the tree in Rockefeller, so I was super excited. And there were people ice skating just below it! It was great. And this guy driving a horse and buggy asked me, in a thick Russian accent if I wanted a ride. I told him no thanks and then he said it was free for me! I figured there had to be some kind of catch, so I said no again, but while I was walking away I thought I should have done it! It sure seemed like my lucky day. After some more wandering around I decided I was too exhausted to continue, so about midnight I caught a taxi back to LaGuardia, where this time, I had absolutely no trouble sleeping. I kept my newly autographed CD and DVD secure in my purse. Purse secure in my lap, with the strap around my arm. No one was getting those things! (I officially have prized posessions now!) I woke up and 3:45am, so I could go check in and get through security. My flight left New York at 6:00am last Tuesday morning and it took me a couple of days to recuperate. (Especially considering the fact that Wednesday I turned around and went to Dallas to see Aerosmith play. Which was great, by the way.) Actually if I'm being completely honest, I think I've only just now recuperated from my little adventure, so that's why it's taken me so long to share with you guys. And I do it again tomorrow if I had the chance!